How do we fix the housing problem? The downward pressures on the housing market continue. The opposing force - inflation brought about by Federal Reserve policy - is a blunt instrument that has potentially explosive side effects. How do we unwind six decades of malinvestment in a development pattern that cannot financially sustain itself? Last month we started collecting donations to cover the cost of producing a DVD version of the Curbside Chat. Our goal was to connect with 100 of our readers that would be willing to donate $25 each. We've taken quite a bite out of this so far -- we've signed up 31 -- but we still have a ways to go. If you value what you read here or what we produce in our podcast, please do what you can to help us spread this message. We thank you, especially if you are one of our 850+ Facebook connections! It was only a year ago we were still below 200. Thanks for spreading the word. Last week, Rob Steuteville of the New Urban Network published a series on the coming housing calamity. (Part 1, Part 2) Yes, that is coming, as in yet to happen. The posts were inspired by a presentation from Arthur C. Nelson at the Forum on Land and the Built Environment in Cambridge, Massachusetts, and they describe how the baby boom generation selling their homes combined with shifting preferences and economics amongst potential buyers are going to drive down home ownership rates and the demand for new homes, especially within the current development pattern. This is a powerful narrative that adds to the growing body of evidence suggesting (a) we have massively overbuilt the number of single-family housing units in this country and (b) housing prices are more likely to move dramatically downward than dramatically upward. When you combine this with the Strong Towns insight that our pattern of development cannot be maintained using the excess wealth it generates, you have a toxic mix. That should not suggest that we've started to come to grips with reality yet. Our first attempt was to try and prop up housing with first-time homebuyer credits and other gimmicks to artificially create demand. Currently our collective delusion is nowhere more clear than with the talking heads on CNBC and the wishful thinking over the Federal Reserve's ability to solve our problems. There is a sense in some important circles that we can, through Federal Reserve monetary policy, gently adjust our way out of this problem. Continued low interest rates is one aspect of this strategy. The lower the interest rates we maintain, the greater the buying power of a set housing payment. Historically-low interest rates have certainly kept housing prices from falling faster than they have. Another aspect of this is the loosening of the money supply and the higher acceptable rate of inflation. The Federal Reserve is tasked with maintaining the stability of the currency and, at least in theory, tries to keep the inflation rate as close to zero as possible. An inflation rate of zero means that prices are stable and are not being artificially driven upward by an excessive amount of money in the system (resulting in cheap or easy credit and a financial boom or bubble). The Federal Reserve has raised inflation expectations and has actually suggested, as part of their quantitative easing program, a target inflation rate of 2%. In other words, they are adding money to the economy (largely by giving it to banks, which largely give it to the U.S. Treasury) in the hopes that it will get things moving again, get people spending and "kick start" the economy. Let's look at how this might impact the housing market. Take a homeowner who purchased a $300,000 home at the height of the bubble with just 10% down payment. That house has dropped in value for three years in a row and is now probably worth around half of its peak value. If the house now started to inflate in value by the target rate of 2% per year, here is how that would impact the ability of the homeowner to get out from underneath their underwater mortgage. Assuming a static economy (no further housing correction) with inflation driving "growth", in twelve years, this home owner would be solvent again. If you ramped inflation up to 4%, you could get there in nine years. Of, if we had a much higher rate of 10%, we could cut that to 5 years. So why not just print money, inflate this debt problem away, restore mobility and let's just get on with it? We could get back to building homes, adding new highway lanes, selling cars, employing all of those people in the construction-related industries and basically get our American mojo back again. We can just reset right back to 1990 and do this thing all over again (but we'll be smarter this time and not allow subprime CDO's). First, there is no evidence that a higher inflation rate would actually wind up reflecting in the housing sector. 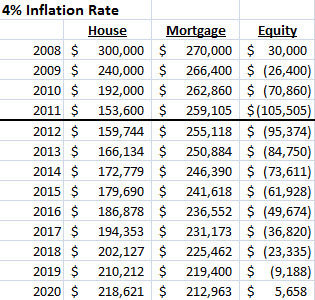 Steuteville's post of Nelson's research shows that there are so many downward forces on housing right now that it is not clear that a higher overall inflation rate could save the housing market. There is a strong chance we would get lower housing prices anyway, but after a long bout of inflation everything else would cost more too. That is not a good combination. Second, instead of housing, higher inflation is likely to show up in other sectors of the economy, particularly commodities and imported products. Here is our theoretical inflation rates as applied to gas prices at the pump. You can see that with 10% inflation we could help homeowners get out of their bad mortgages, but we would also be paying over $6 a gallon for gas (and that assumes we stay in the same spot on the supply/demand curve, which we won't). Again, what do high gas prices do to the value of our suburban and exurban housing stock? That's right: it drives it downward. So inflation likely creates this downward feedback loop because of the energy-reliant nature of our development pattern. Third, it is important to understand that inflation is a tax on savings and investment. Any inflation-based bailout of the housing sector is simply a tax on people who have saved prudently and did not buy the McMansion they could not afford. How strong of a society would we create by bailing out all of the wasteful decision-makers and their malinvestment at the expense of the prudent and the wise? Finally, there is nothing to suggest that we can fine tune such a complex economy in this way. While the Federal Reserve and many economists are confident they can add just the right amount of money in the system to get it sloshing around at a 2% inflation rate, others suspect the flow of money might be like water building up behind a dam. You can add and add and add and see no impact to the downstream flow, but once the dam breaks, the money spills out everywhere and you have a flood of hyperinflation. For me, I am not sure what is going to happen, but the risks of really high inflation do not seem to be justified by the potential that we just might be able to bail out bad housing investments, paying much higher prices for everything from gas to groceries in return. I think most people would agree with that in theory, but it is not like the opposite is a great scenario either. Massive housing default, bank failures, a drying up of credit and capital and likely much higher unemployment for a significant amount of time. How do we unwind six decades of malinvestment in an American development pattern that cannot be financially sustained? That seems to be the question of our time. While we are trying to figure it out, we have huge segments of the work force sitting idle waiting for a recovery in construction that is not going to happen. Most of the rest of us worry about the impact high gas prices will have on our commutes and our trips to Wal-Mart. It seems as if we collectively acknowledge that massive change is necessary, but seem intentionally oblivious to the extent it is going to impact what we have come to know as the American way of life. None of this is more evident than in the leadership of our cities and towns. We've stripped these places of any substantive ability to innovate and respond to stress. And now, in what has to be considered the best case scenario, they will have their tax base - which has been effectively cut in half - recover to 2008 levels by 2023 while their cost of doing business increases by 30%. It is time to focus on building Strong Towns. Care to help us spread the word? We're just three guys working to save the country's towns and neighborhoods. Your donation of support would be much appreciated.